Welding Equipment & Consumables Market Size was estimated over USD 19 billion in 2016 and the industry will grow by a CAGR of more than 4% up to 2024. Construction industry growth in emerging economies such as India, China and Brazil will boost the welding equipment & consumables market demand in near future. These countries have a stable economic growth backed up by the growing construction industry in the regions. Increasing population in India and China are demanding home and better infrastructural facilities. These factors lead to rapid urbanization as people from rural and underprivileged areas move to the developed regions for the need of employment, education, and food. New industries are set up in these regions to support the growing needs of people, thus, leading to industrial development, fueling the market demand. Increasing oil and natural gas demand round the world and increasing explorations will also drive the welding equipment & consumables market. Energy needs have risen significantly for the past few years owing to increasing industrialization, automation, automobiles, and other such factors. Companies have been exploiting the coal, petroleum, and natural gas resources round the globe due to high fuel demand as an important source of energy. Extensive use of crude oil in industrial activities, and transportation industry will lead to more fossil fuel demand which, in turn, will create new growth avenues for the product industry. Emerging technologies such as friction stir welding in the automotive industry may, in future. lead to growth restraints for the welding equipment & consumables market. This technology is a joining process of two facing work pieces in the solid state by using a non-consumable tool. The process is carried out without melting the material. It is gaining popularity in the shipbuilding, aerospace, and transportation industries and may negatively impact the market. Based on product, global welding equipment & consumables market is segmented into equipment and consumables. The equipment considered in the report include laser-beam, oxy-fuel, resistant, arc, and others such as ultrasound equipment. 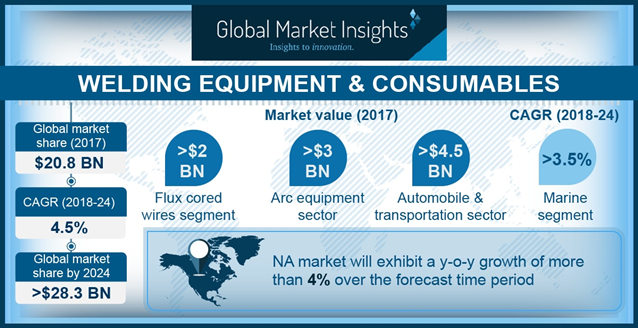 The arc equipment segment held a major share in the global product industry. These products are generally used for the joining of base metals. The segment generated around USD 3 billion in 2016. Oxy-fuel held a tenth of the welding equipment & consumables market in the base year of 2016 and promises growth at over 4.5% CAGR in the forecast span. Oxy-fuel is popularly known as oxy- or gas, and is one of the oldest forms of welding. This equipment finds maximum application in home based shops and metal-based artwork. Increasing engineering activities in industries and other activities will drive the market in future years. Consumables are broadly classified into SAW & fluxes, flux cored wires, solid wires, and stick electrodes. SAW & fluxes provide a covering over the weld and protects against spatter and sparks. Flux cored wires allow a high deposition rate and work well in outdoor conditions. In 2016, the flux cored wires segment accounted for around USD 900 million in the market. Global welding equipment & consumables market applications are automobile & transportation, building & construction, marine applications, aerospace & defense, oil & gas, metal working, and others. The others segment consists of heavy machineries manufacturing, mining, & quarrying, etc. Automobile & transportation application generated over USD 3 billion in 2016 and will increase at an exponential rate. The increasing construction in the developing regions will also drive the building and construction segment. Marine applications in the welding equipment & consumables market include offshore and shipbuilding activities. Rising international trade and commerce along with growing trend of luxury cruising in the developed countries have driven the shipbuilding industry to a large extent. The marine segment will grow with over 4.5% CAGR in the forecast period, boosting the overall market significantly. Based on region, Asia Pacific held the maximum share in the global welding equipment & consumables market. Increasing industrial activities and development in the automotive, transportation and construction industry in the Asia Pacific region will drive the product industry in future years. Increasing use of vehicles in China, India, and Japan; developing infrastructure; and huge construction activities undertaken by the local governments will propel the market in coming years. With close to a fifth of the total share, North America will grow with over 4% CAGR in the forecast timespan. Due to new and developed technology, arc equipment find maximum usage in metal joining activities. North America welding equipment & consumables market will exhibit growth owing to huge oil and shale gas extraction activities in this region. 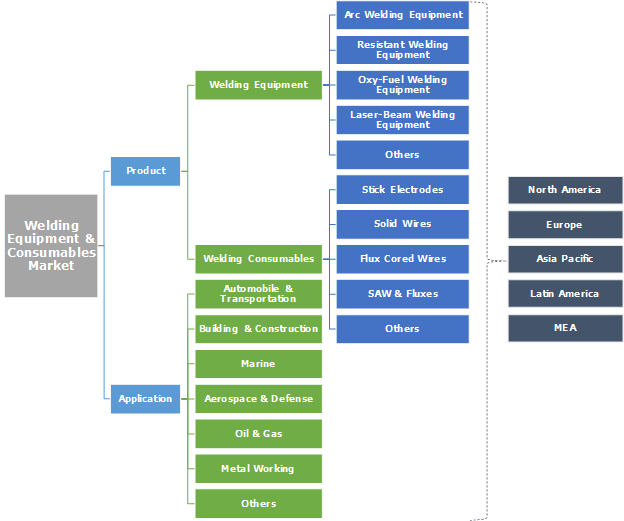 Key industry players present in the global welding equipment & consumables market include Arcon, DAIHEN Corporation, Doncasters Group, ESAB Group, Fronius International GmbH, Lincoln Electric Company, Miyachi America Corporation, Miller Electric, Obara Corporation, Panasonic Corporation, ROFIN-SINAR Technologies, Sonics & Materials, Voestalpine AG, Kiswel, and Senor Metals Private Limited to name a few. The competitive landscape is highly intense with companies relying on new technology development along with merger and acquisitions to maintain their market positions. Lincoln Electric Company, a multinational engaged in the production of equipments & consumables, and robotic systems, acquired all of the assets of U.S. based Arc Products in early 2011. Welding equipment & consumables market has extensive applications in almost all the major industries including, building, construction, aerospace, oil & gas, automobile, and others. Products in this industry have different features and are technologically developed continuously. Increasing use of the process for commercial purposes will drive the industry in the forecast period. Different products and consumables find applications in several end user industries, creating demand on a large scale. Various such equipment are used for a number of industrial activities, and development in these activities create new methods such as laser-hybrid. The process uses principles from arc and laser beam for even & superior properties, and support each other for obtaining higher quality beam.